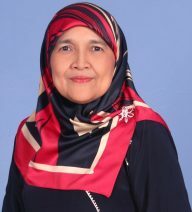 Professor Normah’s current research interest is in the area of Islamic Microfinance where she works very closely with a large microfinance provider and groups of single mothers and disadvantaged women in Malaysia who are involved in a tailoring business. Through a reformed microfinance model, she links the women entrepreneurs to a group of suppliers who supply raw materials and a hypermarket who purchases the finished goods. Her research group provides business and financial management training to the entrepreneurs. Her research has produced multiple outcomes but the most significant is seeing positive changes in the entrepreneurs’ quality of life.